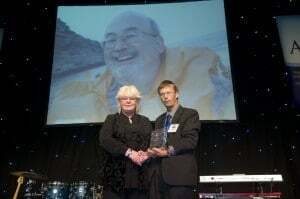 OATA has given a posthumous Lifetime Achievement award to one of its founding members David Keeley. 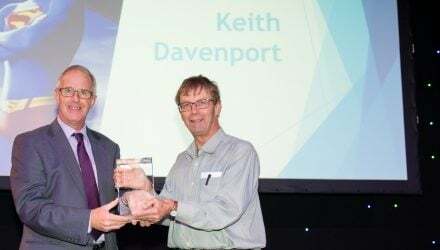 David, who ran Underworld in Loughborough for many years, helped set up OFI UK in 1991, which later become known as the Ornamental Aquatic Trade Association (OATA). He was a popular and well-known figure in the industry, until his untimely death in 2010. The Lifetime Achievement Award was handed out at the AQUA 2013 show in Telford. This year, David’s widow Jenny was present to accept the award from OATA Chief Executive Keith Davenport at the show dinner. “He was a very private person and liked to keep in the background so he probably wouldn’t have liked the attention but secretly he would have been very pleased. I am sure if he had been here to accept the award he would have had a few anecdotes to impart. He was a man of integrity with a great sense of humour who really cared about the industry and I think he would have been extraordinarily proud,” said Jenny.